This photo was taken almost 12 years ago. It's pretty surreal that it's been that long, friends! This is my oldest son, romping on the beautiful beach in Daytona, during his very first family vacation. I will never forget this vacation. It was low key, laid back, and lovely. Just lovely. We slept late, played in the sand, dipped our toes in the beautiful ocean, and splashed in the pool. All day long, for 4 days straight. There was no pressure to navigate jam packed theme parks and attractions. Though when we did choose to venture out from our ocean front resort, there was an abundance of family friendly attractions to explore all around us. This trip will forever stand out in my mind as fun and relaxation, in it's purest form. This year, we're heading back to Daytona Beach, to recreate some of that magic and fun that we experienced all of those years ago, on our very first family vacation. Sure, our family may have changed and expanded over the years; we are a family of 6 now. But my friends, Daytona is still Daytona, and we can't wait! Does a low key, laid back family vacation sound heavenly to you right about now? 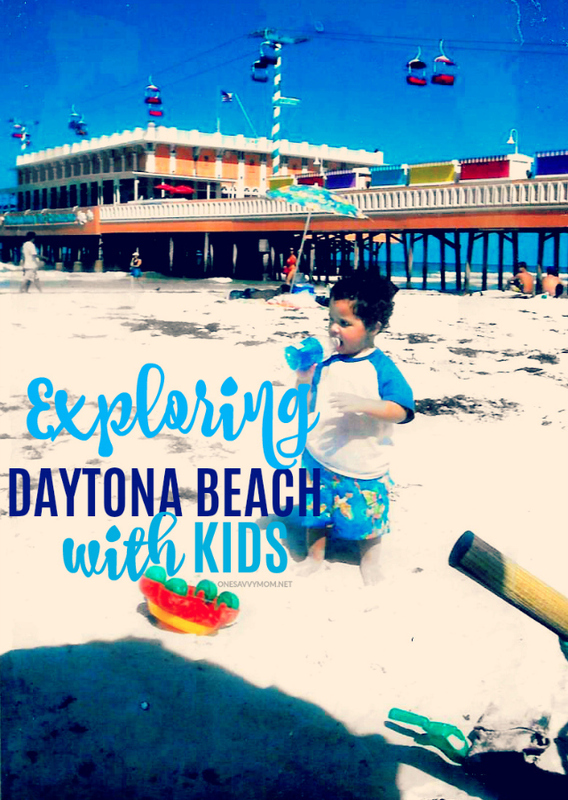 Check out our carefully curated list of family friendly spots to stay, play and explore in Daytona Beach, below. Let's start with a biggie. Where to stay? Nailing down the perfect family friendly accommodations is always one of the toughest parts about planning a family vacation. While there are several amazing hotels and resorts in and around Daytona, our #1 pick? The Daytona Beach Resort and Conference Center, hands-down! This gorgeous resort offers beautiful room accommodations and a laundry list of ammenities. 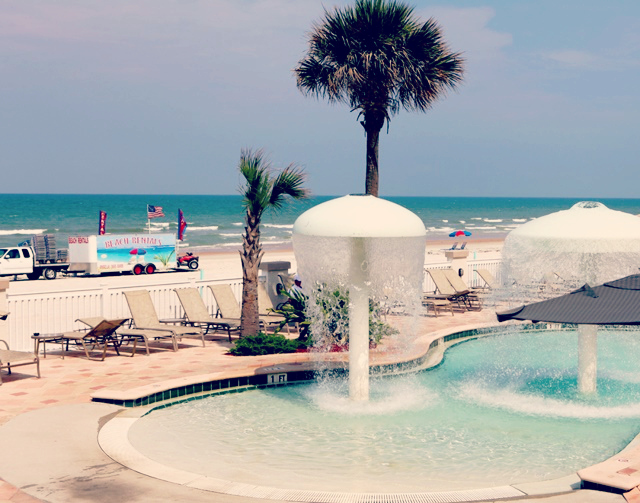 The hotel itself sits directly on some of the most beautiful stretches of beach that you'll find in Daytona. The resort property also boasts 4 pools, several on-site restaurants (though each room/suite also has it's own convenient kitchenette as well) and planned family friendly activiites each and every week. Explore the Daytona Beach Boardwalk! Located right on the beach, the Daytona Beach Boardwalk is home to several local shops, restaurants, an arcade, and an amusement park. In addition to free concerts throughout the summer (located in the Bandshell), they also offer up a beautiful fireworks display at 9:45 every Saturday (from Memorial Day through Labor Day). Learn! After you've explored and enjoyed the beaches, learn more about marine life with the kids, at the Marine Science Center (located on Lighthouse Drive in Ponce Inlet). This hands-on marine life experience, is sure to leave you all with memories that will last a lifetime. Walk one of the world's most famous beaches at Ponce Inlet, and finish your visit with a climb to the top of the Ponce De Leon Inlet Lighthouse. If you happen to be travelling when the moon is at it's fullest - be sure to check out their "Climb to the Moon" tour! Finish your trip off on a sweet note, at the renowned Angell & Phelps Chocolate Factory. The factory opened in 1925 and still does things the old fashioned way. Angell & Phelps offers FREE 20 minute tours daily; visit with the kids and make it sweet a learning experience). Now, when you think of Daytona, don't just think Nascar. There's so much MORE to explore and enjoy with the entire family in tow, when you visit Daytona Beach, Florida. Now it's official. I can't wait for our upcoming family vacay! It's been a long year, friends. Daytona is just what my soul needs to refresh & rejuvenate!